Birthplace : Temple, Oklahoma. U.S. Since the 1960s, activist LaDonna Harris had been an outspoken advocate on issues of concern to Native Americans, women, children, and the mentally ill. In 1970 she founded Americans for Indian Opportunity (AIO), and continued to lead that organization nearly two decades later. As a member of the Comanche tribe whose father and husband of many years were non-Native Americans, LaDonna Harris has the benefit of experience in several different cultures. During the 1960s and 1970s, her work as an activist took her around the world, and she gained an even wider perspective. Her chief interest, however, has remained with her own people-not just the Comanche tribe, but all native peoples of the Americas. In a 1997 profile of Harris, New Mexico Business Journal quoted her sardonic reference to the difficulties she repeatedly encountered in explaining the painful situation of Native Americans to white politicians in Washington. The article mentioned the "endless explanations of Indian history" which she has been required to give, explanations which Harris refers to as "Indian 101." Her own early experience was certainly an education, made doubly so by the fact that her father was a white Irish-American, and her mother a Comanche. Not long after Harris's birth in Temple, Oklahoma, on February 15, 1931, her father left her mother, in part because of the constant hostility they faced as a racially mixed couple. Harris's grandparents raised her, and through their influence she grew up educated in both white and Indian culture. Her grandmother was a Christian, whereas her grandfather-a former Indian scout at Fort Sill, Oklahoma-was a tribal medicine man. But the two showed by their example of mutual respect for each other's beliefs that two cultures could exist side by side in harmony. school she had to learn English. Meanwhile, in her home the primary influence remained the Comanche tradition. Years later, in high school, she met the young man who would become her husband. Fred Harris was not a Native American, but like her, he had experienced poverty and hardship as the son of a sharecropper. He wanted to go to law school and run for public office, and after they were married, she helped put him through college and law school. The Harrises had three children: Kathryn, Byron, and Laura. Fred was elected first to the Oklahoma state senate, then to the U.S. Senate. With Fred's election in 1965, the Harrises began to divide their time between Washington, D.C., and their home in Oklahoma. Perhaps this experience helped to expand Harris's vision to encompass national issues, because in 1965, she began an effort that mirrored the civil rights movement then making great strides on behalf of African Americans in the Southeast. But she was working in the Southwest, and she undertook her activities on behalf of Native Americans. Operating from a base in the Oklahoma town of Lawton, Harris sought to bring together the state's tribes to combat segregation. This period saw the birth of an organization called Oklahomans for Indian Opportunity, which had members from 60 tribes. The group defined a set of goals which equated economic priorities with political ones, placing an emphasis on improvement of economic conditions for Native Americans while remaining committed to securing civil rights for them. Harris's work on this organization's behalf helped earn her recognition as "Outstanding Indian of the Year" for 1965. Meanwhile, back in Washington, D.C., Harris's activities expanded. She became a nationally recognized advocate on behalf of Native Americans, and numerous groups sought her involvement in projects designed to assist the Indian population in achieving greater civil rights. Harris became involved with the National Rural Housing Conference, the National Association of Mental Health, the National Committee against Discrimination in Housing, and the National Steering Committee of the Urban Coalition, which she chaired. In 1967 President Lyndon B. Johnson appointed Harris to lead the National Women's Advisory Council of the War on Poverty, an organization charged with assisting all Americans in enjoying the benefits of civil rights and economic prosperity. Johnson's administration created the National Council on Indian Opportunity, and in 1968 the president appointed Harris to a position with the new commission. Clearly Harris had come a long way from her humble beginnings in Oklahoma, and the coming years would see the expansion of her vision from a national to a global one. Harris's appointment to the National Council for Indian Opportunity coincided with the end of Johnson's administration and the beginning that of President Richard Nixon. In fact, the council did not actually meet for the first time until a year into Nixon's presidency-in January of 1970. Harris began to believe that Vice President Spiro Agnew, whose responsibility the council was, did not feel any great sense of urgency with regard to the issues it was intended to address. Finally she decided to leave the council. During the early 1970s Harris became heavily involved in work both at home and abroad. 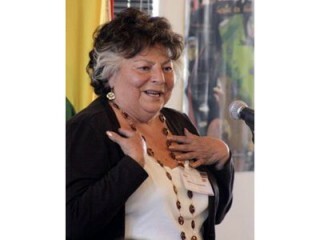 A founding member of the National Women's Political Caucus, in 1970 she also founded Americans for Indian Opportunity (AIO), and assisted women's and Native American grassroots organizations in their efforts on behalf of their constituency groups. Another cause of interest to her was that of the mentally ill. Harris also became interested in the needs of native or indigenous peoples around the world, and travelled to Latin America, Africa, and the former Soviet Union as a representative of the Inter-American Indigenous Institute. In this capacity, she participated in a number of conferences on world peace. In 1975 President Gerald R. Ford named Harris to the U.S. Commission on the Observance of National Women's Year. But Harris's husband was retiring from the Senate, and the family decided that it was time to leave Washington, D.C. Instead of returning to Oklahoma, however, the Harrises moved to New Mexico, and the AIO relocated its offices with them. While concentrating her efforts more fully on the AIO, Harris also maintained her global vision. Thus when Cyrus Vance, secretary of state under President Jimmy Carter, offered her an appointment to the United Nations Education, Scientific, and Cultural Organization (UNESCO), she accepted. In line with her interest in the cause of native peoples as a global and not merely national phenomenon, Harris had become interested in the U.S. Peace Corps as an effective instrument to assist in local development for indigenous peoples around the world. When President Carter appointed her to serve as special advisor to Sargent Shriver, who directed the Office of Economic Opportunity, she was able to realize this vision. The "Peace Pipe Project" trained Native Americans in skills necessary to assist in development of communities, then sent them to work in indigenous communities throughout the Western Hemisphere. The value of the Peace Pipe Project, which remained a limited effort, was that native peoples in other countries were more likely to trust the advice of another indigenous person than they were a white official. While working with the Office of Economic Opportunity, Harris also introduced another initiative of interest specifically to Native Americans in the United States. Called the Council for Energy Resources Tribes, the program assisted tribes in acquiring the best possible monetary returns for the natural resources located on tribal lands. The council, which was not without its critics, also helped tribes protect those resources if the tribe chose not to exploit them. In the 1980s and 1990s, Harris remained active with the AIO. She founded the National Indian Housing Council and the National Indian Business Association, but continued with the AIO as director, although daughter Laura Harris Goodhope also assisted with those responsibilities. According to a profile in the New Mexico Business Journal, Harris lived on the Santa Ana reservation near Bernalillo, outside of Albuquerque, New Mexico. Her home, owned by the reservation, also doubled as the main office of AIO. Divorced from her politician husband, Harris devoted most of her time to the organization. Among the AIO's achievements in the 1990s was its work to strengthen tribal organizations for groups located as far apart as Alabama, Wisconsin, and Nebraska. Concern for the environment continued, and the AIO hosted regional meetings on that subject. With the greatly increased traffic on the "information superhighway" in the early 1990s, the AIO was quick to establish a significant Internet presence on behalf of Native Americans. It founded INDIANnet, which helps tribes and other groups set up Web pages and make the best possible use of the Internet's resources. The AIO, according to its own INDIANnet Web site, facilitated Harris's participation in the United States Advisory Council on the National Information Infrastructure, a group headed by Vice President Al Gore. According to the New Mexico Business Journal, among the projects most important to Harris was the American Indian Ambassadors Program, funded by Kellogg's, the cereal manufacturer. Each year, advisors to the program choose some 30 young professional men and women from tribes throughout the United States. Each of the selectees serves as "ambassador" for a year, during which time he or she goes to Washington, D.C., and learns about the political process. The selectees also tour reservations around the country, and visit a selected tribal group in Central or South America. Commenting on gaming, the federal policy that allows Indian reservations to operate casinos as a means of economic development, Harris has remained cautious. "I hate to see gaming of any kind used to support regular government, " she told an interviewer for New Mexico Business Journal. "But the tribes have no other method that commands this degree of success." After 30 years as an activist, Harris remains positive about the future of Native Americans: "Exasperated-yes. Tired-maybe. But not angry, " concluded the interviewer. "Despite years of dealing with Washington bureaucracy, despite funding cuts, run-arounds and red tape, Harris remains soft-spoken, optimistic, and certain that change for her people can occur."